The Well-Appointed Catwalk: They Like Me, They Really Like Me! 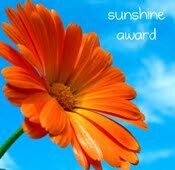 The blogger from the Deconstructed Life was kind enough to present me with this Sunshine Award. It's quite an honor considering I pretty much think she's the cat's pajamas! Hey, thanks for the love Sunshine! Thanks for the award :) ! It was a lovely surprise and I feel honored too. Thank you so much!